Jane Duffy was born in Co. Longford in 1832. She escaped from the Famine and arrived in Stafford around 1852. There she married a local farm labourer, George Moore and they had two children, but George died in 1864. 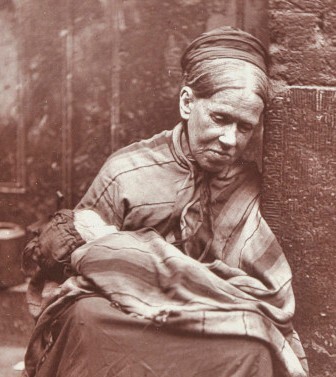 Jane was left a widow – a poor and vulnerable woman open to exploitation. She had to find work and she inevitably went back to the only job she knew, domestic service. Who looked after her children when she was at work? The answer is Harriet Moore, the widow of George Moore’s father who lived close by in Broad Eye. In 1870 Jane became pregnant. The following summer she had a baby boy, Charles. His birth wasn’t registered and his father’s name is unknown although it was claimed the father gave ten shillings a month for the baby’s maintenance. Within three months Charles was dead. The inquest revealed a miserable state of affairs. Jane Duffy/Moore was now working in Burslem and Harriet Moore was looking after Charles. On 21 September he was so ill she took him to a surgeon who gave her a ticket for the infirmary. By the time she reached hospital Charles had died. The doctors who examined him found he was ‘in an exceedingly emaciated condition’ and weighed only five pounds twelve ounces, half the normal weight for a three-month old baby. He had starved to death. Who was to blame? Jane Moore claimed the child had been ‘a small and weakly one from its birth and it had been troubled with thrush and frequently vomited its food’. Harriet Moore claimed she had fed Charles on ‘arrowroot, corn-flour and new milk every day’. The medical men doubted the truth of this but also suggested the baby might have been allergic to cow’s milk. It was clear, however, that Charles had really died from neglect. Although the inquest jury found that the baby had died from ‘inanition’, the coroner said Harriet Moore had only narrowly escaped being tried for manslaughter. Charles Moore’s death lifts a curtain on the deprived existence of Jane Duffy and her community. As a servant, Jane was vulnerable to the sexual predations of her employers. The ten shillings a month maintenance was probably the pay-off from such a man. Charles was an unwanted baby and if he died a troublesome burden would be removed. ‘Several witnesses living in the vicinity corroborated the principal portion of [Jane’s] evidence’ that the child was weakly. Not surprising. It was a street of poor families, a number of whom were Irish. Jane’s problem was one they could sympathise with and they stuck together with a consistent story. Jane Moore stayed on in the Broad Eye, doubtless working as a charwoman or servant. Her life was to have a final twist because in 1876 she married John Trevedon, a labourer at the gasworks. The marriage was not to last. John deserted his wife in 1881/2 and probably sneaked off to America. On 13 September 1882 the lone Jane ‘Tributon’ was admitted as a pauper to Stafford Workhouse. It was the end of her life’s road from Co. Longford. She died there in March 1884, aged just fifty-two. Jane Duffy was just one of hundreds of thousands of young single women who emigrated from Ireland in the second half of the nineteenth century. Illiterate girls like her had only their labour power to sell and Jane, like many others, went into domestic service. She was a victim of the common but capricious forces of Victorian society – early death, desertion and male sexual predation. We also see the brutalising effects of poverty and uncertainty in such a society. No public remorse was shown by Jane, Harriet or anybody else over Charles Moore’s death. His burial was a perfunctory affair and Jane probably didn’t even go. There were no mourners at Jane’s burial either. She died alone in the impersonal poverty of the Workhouse. Staffordshire Advertiser, 30 September 1871. SA, 30 September and 7 October 1871. On 26 March 1883 a John ‘Trevethan, joiner, aged about 40’, arrived in New York aboard the ‘City of Paris’. New York Passenger Lists, 1820-1957, Serial M237, Roll 462, Line 16, List No. 33, Ancestry Database accessed 10th September 2013. Staffordshire Name Index on-line, D659/1/4/10, Stafford Poor Law Union, Workhouse Admission Book, 1836-1900. Stafford BC Burial Record 05/8471, 13 March 1884, Jane ‘Tributon’, pauper, Stafford Union Workhouse.